MIAMI, July 19, 2018 /PRNewswire/ -- Carnival Corporation & plc (NYSE/LSE: CCL; NYSE: CUK), the world's largest leisure travel company, today released its eighth annual sustainability report, announcing that in 2017 the company achieved its 25 percent carbon reduction goal three years ahead of schedule and is on track with its nine other 2020 sustainability goals. 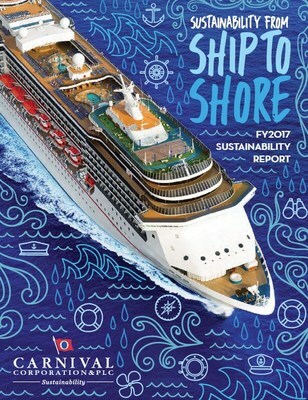 The full 2017 report, "Sustainability from Ship to Shore," was developed in accordance with the Global Reporting Initiative format and is available online at www.CarnivalSustainability.com. Looking to the future, the company continues to chart its sustainability journey, using the United Nation's 17 Sustainable Development Goals as a framework to identify new environmental management, energy efficiency, health, safety and wellbeing objectives to strive toward by 2030. "We recognize that to be a responsible global organization and good corporate citizen, we need to have sustainability ingrained in all aspects of our operation across our nine global cruise line brands and more than 100 ships," said Bill Burke, chief maritime officer for Carnival Corporation, whose nine global cruise line brands include Carnival Cruise Line, Cunard, Holland America Line, Princess Cruises and Seabourn. "We are committed to consistently exceeding the expectations of our guests for great vacations but we are also deeply committed to being a model for sustainable tourism throughout the world. It is through the dedication of our passionate and diverse workforce that we are able to make such great strides in every aspect of our operations. We congratulate each of our 120,000 employees for helping us achieve and exceed our carbon reduction goal well ahead of schedule." Advanced Waste Water Purification Systems: increased coverage of fleet-wide capacity by 6.2 percentage points from 2014 baseline. Together, the company's standard and AWWPS systems meet and/or exceed water treatment requirements established by the International Maritime Organization, and national and local authorities. Liquified Natural Gas (LNG) is the most environmentally-friendly and low-emission fuel currently available. As part of the company's commitment to reducing air emissions and improving air quality in the ports and ecosystems it visits, Carnival Corporation has invested in two major environmental intiatives, EGCS and LNG, that are leading not just the cruise industry but the overall maritime sector and provide a balanced approach to fuel usage and clean-air emissions. In 2017, Carnival Corporation received the Lloyd's List Americas 2017 Cleaner Safer Seas Solutions Award for its commitment to LNG operations and cleaner air. "The draw of the ocean's vast beauty is at the center of what makes cruising such an extraordinary vacation choice for the 12.1 million guests who sailed on our 103 ships in 2017," said Elaine Heldewier, sustainability director for Carnival Corporation. "Doing our part to ensure the health and vitality of marine environments long into the future is not only the right thing to do as good corporate citizens, but it's essential to what we do as a business. We are always looking for better ways to improve our technology and processes to further increase efficiencies and decrease our effects on the environment." Ensuring environmental compliance and proper implementation of procedures at sea and in port is the responsibility of full-time Environmental Officers working onboard every ship in the Carnival Corporation fleet. In 2017, a weeklong, fleet-wide global training program was implemented for these dedicated senior crew members. The required annual training course, conducted at Carnival Corporation's CSMART Academy at its Arison Maritime Center in the Netherlands, is designed to further develop environmental and technical expertise for the more than 200 Environmental Officers who support the fleet. The relief efforts of Carnival Corporation's cruise lines and staff will continue long-term as islands and communities affected by the hurricanes rebuild. With 1 in 10 residents of the Caribbean directly employed in a tourism-related job, cruise lines have committed to continue to bring ships and guests into ports to help those employed by tourism and related industries. The organization operates the world's largest civilian hospital ship, the Africa Mercy, with a crew of over 400 volunteers from 40 different nations. In addition to an initial donation of €100,000, the Costa Group committed to continuously staff one engineering position onboard the Africa Mercy, and officers and engineers with Mercy Ships can gain experience and nautical expertise onboard Costa Group ships. Together, the corporation's cruise lines operate 103 ships with 234,000 lower berths visiting over 700 ports around the world, with 18 new ships scheduled to be delivered between 2018 and 2023. Carnival Corporation & plc also operates Holland America Princess Alaska Tours, the leading tour company in Alaska and the Canadian Yukon. Traded on both the New York and London Stock Exchanges, Carnival Corporation & plc is the only group in the world to be included in both the S&P 500 and the FTSE 100 indices.